Wingra Creek Cleanup is a fun paddle between Lakes Wingra and Monona. Help us keep it beautiful too! You can participate by boat or on foot. We’ll provide gloves, trash bags and a water dispenser. Please bring a refillable water bottle to help reduce waste! We will meet at the Strand parking lot on Plaenert Drive, about 0.2 miles west of Park St. Please check our event page at www.lakewingra.org for inclement weather updates the day of. B.Y.O.B (bring your own boat)! Rentals are not available. A canoe/kayak launch is located on the southeast side of the pedestrian bridge. 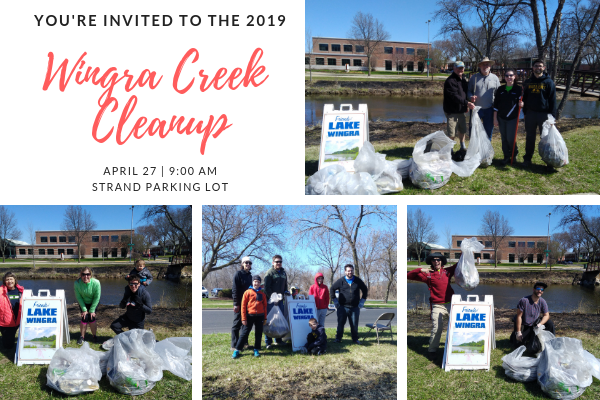 Thank you to Dane County Office of Lakes and Watersheds for helping provide trash clean up tools and Strand for partnering with us on this event. Share with your friends using this event poster!